The amenities at Action Packed Paintball Games makes our facility one of the best paintball fields in Minnesota. We have built our facility to provide your party with all the conveniences you have come to expect for birthday party or bachelor party. Here are just some of the amenities we offer. Located in a central part of our facility, our picnic area is a perfect place for your party to relax between games. There is no charge to use our picnic areas. Spectators will find it even has a great view of several playing fields. This is perfect for those who would rather watch the action than take part in it themselves. If you’re making a day of it, feel free to use our complementary charcoal BBQ grills. 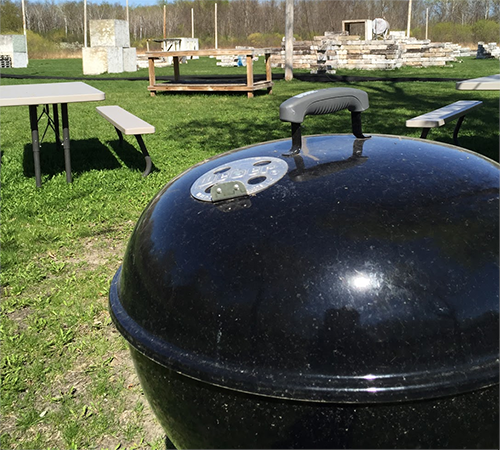 Whether it’s burgers, hotdogs, or even a steak, our grills are a great way to enjoy a day of paintball with your friends and family. Just don’t forget to bring your own charcoal and cooking implements. Restrooms are not one of those things you might think about in advance, but it’s something worth noting. Our facility is one of the only outdoor paintball fields in Minnesota to offer indoor restrooms. That’s right, we even have separate facilities for men and women. It’s one of those comforts you’ll appreciate, should the need arise. Another amenity you might not think about is paved parking. Most outdoor paintball fields can only offer gravel or dirt parking areas. Our facility features a fully paved and lighted parking lot, conveniently located next to our picnic and staging areas. Our paintball facility is conveniently located off of highway 169 in Jordan, MN. Located on the southwest side of Minneapolis, our paintball field is an easy drive from suburbs such as Shakopee, Prior Lake, Edina, Eden Prairie, and Burnsville.